If The Spread Offense Shot-Gun QB Is Obsolete... I Guess So Is Simple Math?? I haven't been able to find the actual coaches name at 'the' Ohio State University that supposedly called the 'shot-gun by the quarterback' in the spread offense obsolete (no longer in use; gone into disuse; disused or neglected - often by preference for something newer, which replaces the subject; Imperfectly developed; not very distinct). That's a little scary if this is true, considering one of the most dangerous players at the quarterback position both running and throwing the football is Terrelle Pryor from Ohio State. And to get to my point in the subject line, I just wrote an article on the famous 'Power' play run in football. 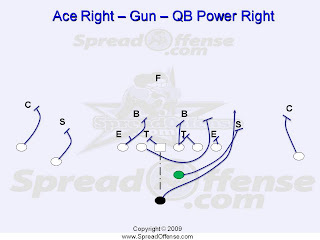 It's not an encyclopedia of information, but if you know football, you'll get the point ... that being in the single wing spread offense (with a dual threat QB) offers a clear advantage, obvious to even the beginner of American Football.